By descent from the artist to the present owner. ‘The Scottish Colourist Series: FCB Cadell’, Scottish National Gallery of Modern Art, Edinburgh, 22 October 2011 – 18 March 2012. Tom Hewlett and Duncan Macmillan, F. C. B. Cadell. The life and works of a Scottish Colourist, 1883-1937 (2011), p. 133, fig. 138. Cadell was born in Edinburgh in 1883 and studied in Paris and Munich. He was the youngest of the Scottish Colourists and was the only one to fight in World War One. After demobilisation in 1919, he moved to Ainslie Place in Edinburgh’s fashionable New Town, where he lived until 1931. Cadell first visited the island of Iona in the Scottish Hebrides in 1912 and returned to paint there, often accompanied by his friend and fellow artist Samuel Peploe. His paintings of Iona depict a wide range of features on the island and capture the quality of light created by the ever-changing weather conditions experienced there. The steady waning of the art market from the late 1920s and mounting debts incurred due to Cadell’s lavish lifestyle saw him move home three times in the last decade of his life. 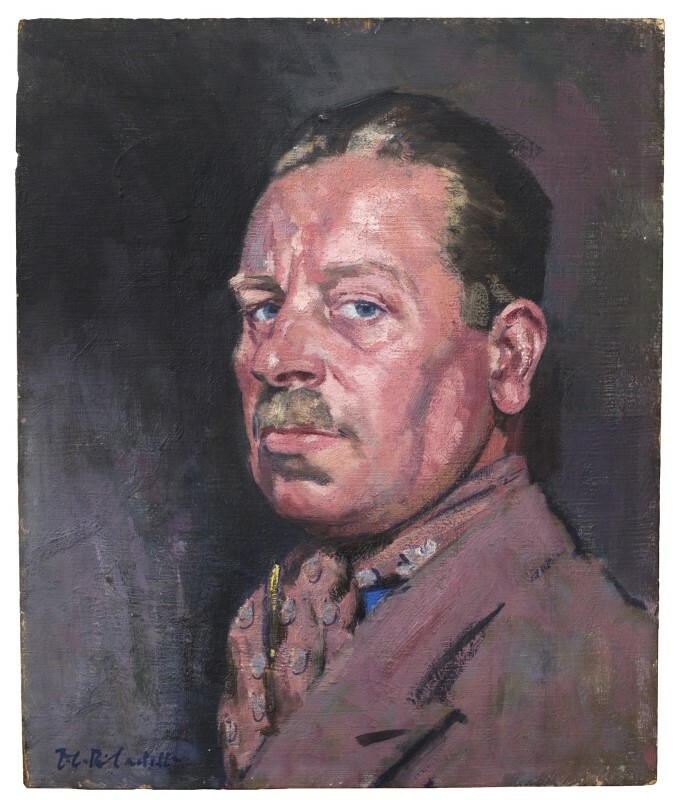 As his personal circumstances and health declined so his official standing grew as he was elected a member of the Royal Scottish Society of Painters in Watercolour in 1935 and the Royal Scottish Academy in 1936. He died in Edinburgh in 1937. The present painting is the ‘strongest’ and most self-assured self-portrait that Cadell ever painted. The unflinching treatment of his own features in the present picture stands in contrast to the more demure and flattering self-portraits of his youth. This picture was probably painted during the summer of 1932 while he was staying on Iona. A sketch of the coast on Iona is on the reverse of the panel, along with the inscription ‘Myself – Iona – 1932’.